The MediLabSecure project is producing numerous exchanges of experiences, training materials and best practices which are shared between the beneficiary partners of the project. Scientific publications produced by the MediLabSecure Network can be accessed at the publications page of this website. Members of the MediLabSecure community can also share their publications with the network via this site or by using the MediLabSecure mailing lists. The training sessions and related documents are engineered in a way that they will support further implementation of the needed laboratory preparedness qualifications. For more information on the workshops and training sessions, please visit this page. MediLabSecure network members have exclusive access to documents and training materials produced throughout the project implementation period in the private area. General and regional meetings are organized periodically to inform the network about new scientific discoveries and to share knowledge among the project partner laboratories and institutions. For more information on the meetings held since the beginning of the projects, please visit this page. Site visits are organized regularly in the partner countries to get a comprehensive view of the facilities available in the countries, research interests and available diagnostic procedures. When possible, meetings with stakeholders and partners from various disciplines are organized. 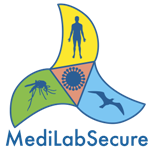 The MediLabSecure Situation Analysis on integrated surveillance of arboviruses in the Mediterranean and Black Sea Region (MeSA Study) is being carried out by the MediLabSecure Public Health Working Group..
For more information on the MeSA study, please visit this page. Information on MediLabSecure members, related projects and experts of the field will remain accessible on the project website after the end of the project. for now, the complete list of member laboratories and public health institutions is available at this page.